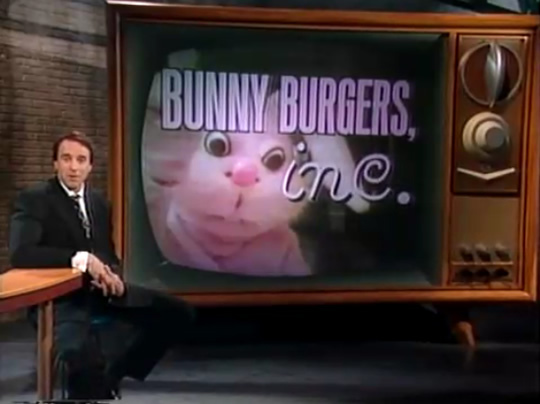 Here's a long-lost video from Spy Magazine's prank done for a 1994 television pilot: Bunny Burgers. Hosted by a young Kevin Nealon, to see "just how low American marketers would go to help us to get a completely ridiculous to your shopping mall," they designed stationary, made a 24-page business plan, hired an actor to play the Japanese billionaire investor, and lured PR flacks to the Ritz Carlton to see if they wanted to represent the company. They ran focus groups and rented a store in a mall in New Jersey, offering bunny burgers to unsuspecting customers, complete with hot pink uniforms and creepy bunny mascot. Said one of the people in the mall: "Who dreamed up this name? It's like trying to sell Bambi burgers, you know?" 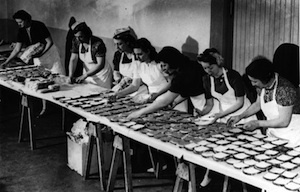 "Yummy yummy got bunny in my tummy / It's the Bunny Burger taste sensation / Kinda like chicken / Kinda like roast beef / Pledge allegiance to the Bunny Burger nation / They love it in France / Come and give it a chance / Bunny Burger.